The worst has come and one man must rise to lead the fight against it. . . . He thought he'd seen the worst . . .
No one knew about the Strangers from beyond Noreela, and it was the Core's job to make sure it stayed that way. Kel Boon was once an agent of the land's most secret organization, tracking, observing, and eliminating the Strangers as part of an elite Core team. But then one horrifying encounter left his superior officer--and lover--dead, along with many innocents. And Kel has been running ever since. But the worst was still to come. . . .
Forsaking magic, living as a simple wood-carver, Kel came to the fishing village of Pavmouth Breaks to hide. But when a mysterious island appears out to sea during a cataclysmic storm, sending tidal waves to smash the village, his Core training tells him to expect the worst. How can he warn the surviving villagers--especially the beautiful young witch Namior--that the visitors sailing in from the island may not be the peace-loving pilgrims they claim to be? That this might be the invasion the Core has feared all along . . . and that he, Kel Boon, may be Noreela's last chance? 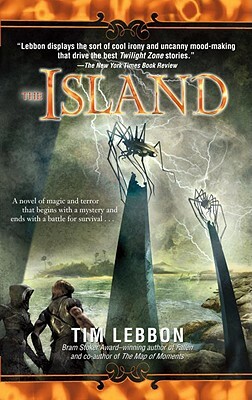 Tim Lebbon has won two British Fantasy awards, a Bram Stoker award, and a Tombstone award, and has been a finalist for International Horror Guild and World Fantasy awards. Several of his novels and novellas are currently under option in the USA and the UK. He lives in South Wales with his wife and two children.